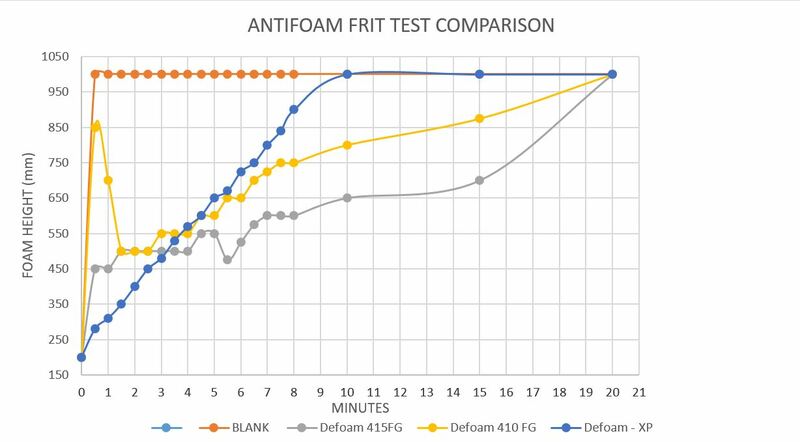 A major Midwestern snack producer had concerns about the high costs of the defoamer product that they were using and were interested in finding an alternative that would be more cost effective. U.S. Water was already a current vendor for the snack producer’s utility water products and services within the plant, and offered assistance in other areas, which included optimizing the foam control needs of the customer. Numerous problems may arise when foaming conditions occur within a facility. Cleaning and sanitation can become more difficult and time consuming due to excess foam. Level sensors, electronic eyes and automatic switches might not work properly, as the foam height can cause false readings. Additional downtime, waste, overflow and lost production are also concerns. From an aesthetics standpoint, foam overflow can be tracked on floors throughout the plant. Continuing to control the foam within their system was the only option they had if they wanted to maintain system efficiencies. U.S. Water conducted thorough lab evaluations that led to field testing of the defoamer product with U.S. Water regulatory staff. This testing would assure that the customer would be selecting the right product for their facility. Once all of the testing was complete, there were three different products that were proposed, all working similarly, but at different costs. However, finding the best product at the best use cost was just the beginning. To optimize the defoamer feed at various points throughout the system, U.S. Water used a proprietary chemical feed control system. In this case, the product was fed to eight different locations in the process where foam was an issue. Rather than feed the same amount of product at all eight locations, the controller allowed customizable control based on varying foam levels throughout the system. In addition, a “boost” feature allows operators to temporarily increase the product feed when process conditions caused additional foaming. In the end, U.S. Water’s recommended solution reduced the chemical use and costs at the customer site and improved system efficiencies by decreasing foam. The customer saved $30K per year, an approximate 25% use cost reduction, and had the added benefit of a 50% reduction in material handling. All of these efforts freed up operator’s time to focus on other areas in the plant.